Home Models Pattie Boyd Children, Spouse, Siblings, Family, Where Is She Now? Pattie Boyd is a former English model, photographer, actress and writer. She was one of the top English models in the 1960s and is revered for changing the world of fashion with her sophisticated and daring sense of style which led to a renaissance in the fashion world. Despite starting from humble beginnings the 1.68m tall English beauty was able to work her way to becoming a huge force in the world of modelling and a source of inspiration to a thousand others. Patricia Anne Boyd was born on the 17th of Match 1940 in Tonto, Somerset. She is of English nationality and White ethnicity. Growing up, she had her elementary education at Hazeldean School in Putney and enrolled at St Agnes and St Michael’s convent boarding school for her high school education but later switched to St Martha’s convent In Haley Wood, Hertfordshire where she bagged her GCE O Level certificate in 1961. After graduating from high school in 1961, she moved to London the following year where she found a job at Elizabeth Arden’s Salon as a shampoo girl. In 1962 while attending to clients at the salon, she met a client who took notice of her stunning looks as well as her body features and advised her to go into modelling. She decided to take the advice and quit her job at the salon at the end of 1962 so as to focus all her time on modelling. Barely two years after venturing into modeling professionally, she hit international stardom as a result of her looks and amazing sense of style, going on to feature on the cover of top style magazines such as Vogue, Honey, Elle and Vanity Fair to name a few. In 1964 she appeared on a Richard Lester directed Ad for Smith’s Crisp which made her popularity soar even higher. Due to the success of the ad, she was cast to play the role of high school girl –Jean, in the 1964 Beatles comedy film A Hard Day’s Night which was directed by Richard Lester. As a model, she went on to achieve several feats such as being photographed by top photographers like Brian Duffy, Terence Donovan, and David Bailey. Although she did quit modelling in the late ’70s, she made a comeback and featured on the cover of Italian Vogue as well as the British Vogue magazine working alongside star photographers like Patrick Litchfield and Justin De Villeneuve. 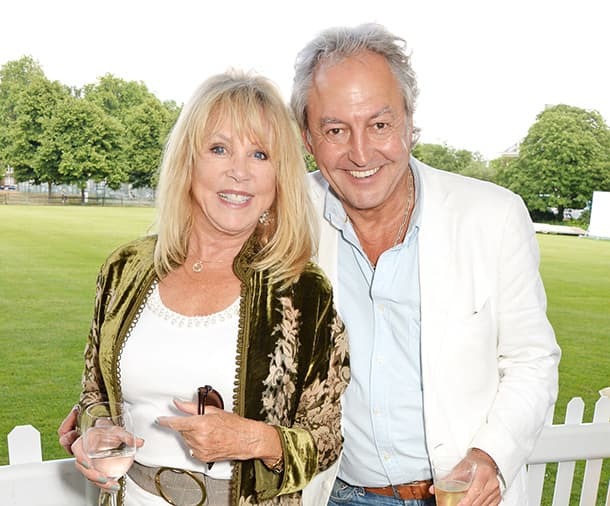 Pattie Boyd is currently enjoying every bit of her life with her longtime partner Rod Weston. The most beautiful thing about their relationship is the fact that they got married in 2015 at the Kensington and Chelsea register office after being together for over 25 years. However, this wasn’t her first marriage as she was once married to Beatles star singer George Harrison who she met on the set of A Hard Day’s Night in 1964. They started dating shortly after and eventually tied the knot in January 1966. According to George, she was his muse and inspired him in writing very popular hit love song – I Need You and Something. The pair eventually divorced in the fall of 1974 as a result of infidelities on the part of George with guitarist Ronnie Wood, but in fact, Pattie too did have an affair with George’s former band Mate Eric Clapton. Two years after getting divorced from George Harrison, she got married to Eric Clapton in 1979 but the pair eventually got divorced in 1989, as a result of Eric’s steady substance abuse of heroin and alcohol as well as numerous infidelities. That being said Pattie is currently enjoying every bit of her married life with Developer Rod Weston even though she doesn’t have any kids of her own. Until recently, very little was known about the family of Pattie Boyd as well as her siblings. In an interview in 2017, she made some revelations about her family which many fans were delighted to know. According to her, she is the first of four children by her parents – Colin Ian Langdon Boyd and Diana Frances Boyd. The other three siblings are Colin who was born in Scotland in 1946, Jenny who was born in Surrey 1947, and Paula who was born in 1951 in Nakuru, Kenya. Her father was an army pilot earlier in life but had a fatal crash that made him lose some part of his memory but her mom married him still, out of obligation and pity. As a kid, they moved from place to place to the point of moving to Kenya to stay with her grandparents. She went on to further reveal that her sister Jenny was also a model and they once set up a clothing store together in London Chelsea fashion Market which they named “Jenifer Juniper” in 1968. Not much is known about the whereabouts of former model Pattie Boyd or what she is up to. Ever since her photo exhibition which she tagged Through the Eye of a Muse in 2005 and the release of her autobiography titled Wonderful Today in August 2007, she has really been very quiet. However, she came back to the spotlight as a result of her marriage to Rod Weston in 2015 but has been on the low ever since. She currently resides in Sussex alongside her Husband Rod and is known to be a huge contributor to a charity called SHARP (Self Help Addiction Recovery Program) which helps people with substance abuse addiction.